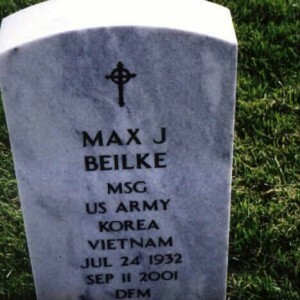 As I was watching Rory Kennedy’s television documentary about the 40th anniversary of the fall of Saigon last month, I kept thinking about Max Beilke. I knew that he had left Vietnam well before that, but I couldn’t remember when. I was curious enough to chase down the information the next day. As a newspaper account from 2001 recalled, it was March 29, 1973. He was the last solider in the line boarding a C-130 at Ton Son Nhut that day for a flight back to “The World.” He carried with him an adorned rattan mat that had been handed to him by a North Vietnamese observer before Max walked up the stairs. The observer was there as part of the Paris peace accords and wished Max, a burly man, well and said he would be welcome to return – as a tourist. The Army designated Max as the last combat soldier to leave the country. Yes, I do know that there were still American soldiers in Saigon as the North Vietnamese tanks approached the city two years later. There were also airmen and sailors in country and Marines other than those assigned to the embassy. They were assigned to the mission as attaches or advisers. I met Max shortly after I came to work for the Association of the United States Army in 1994. He had retired from the Army 20 years before as a master sergeant. When we met, he was the number two person in Army Retirement Services, having come aboard as a civilian employee in 1984. His boss was Gary Smith, a retired lieutenant colonel, who worked doggedly to ensure Army retirees knew what wide-sweeping changes occurring then in the services and benefits meant to them. There were plenty of changes and they were coming quickly – particularly in health care. Over time, I found Max to be a repository of information about the service, military careers [he began his as a draftee during the Korean War], preparing for retirement, commissaries and exchanges, health care and retiree and survivor benefits. The stores were a very large issue at the time because of base closures and health care was even larger as retirees felt that they were being pushed out of the military system as TRICARE was being introduced. If I had a question and I usually did, Max would answer it or direct me to someone who could answer it in the detail that I needed. As I remember, he never failed to get back to me if I left a voice mail or sent an e-mail. He had a Midwestern frankness approach to explaining the issues. He brought that into his regular MAX FACTS emails. I appreciated that candor. I am sure thousands of others did as well. Sometime in August 2001 on a Friday afternoon, I interviewed Lt. Gen. Tim Maude, the personnel chief, for an update on how “people issues” had fared in the oversight committees. I took some pictures of him that day as the interview was ending, and he mentioned that his offices soon were to move into newly renovated spaces in the Pentagon. I said I would check them out sometime after Labor Day, but likely leave some pictures off before then for his use. I did drop the pictures off, probably a week after the interview. I also had some questions either for Gary or Max that came out of the interview, but they could wait until after Labor Day. The questions never got asked. On the morning of Sept. 11, Max, Gary and others were in a meeting with Maude when the hijacked American Airlines Flight 77 slammed into the only renovated section – Kevlar in walls, etc. — of the Pentagon. They were among the 125 killed in the building in that attack. As far as I know, Max never bragged about being named as the last combat soldier to leave Vietnam. Someone at work told me that he was the person the Army designated. When I started the Google search a short time ago, I was really struck by a quote from Max’s sister in the news account of his funeral and death about his walk up the ramp in 1973. 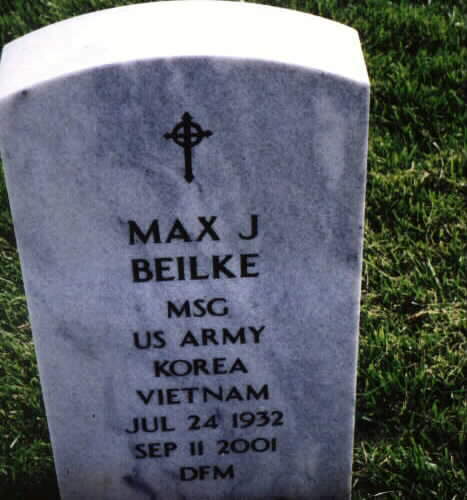 Max is buried in Section 84; site 4639 in Arlington National Cemetery. There will be an American flag on his grave on Memorial Day weekend as there has been every year since he was laid to rest. He is also remembered at the Pentagon Memorial. He was 69 when he died. He was survived by his wife, Lisa, and two daughters.